Incredibily fascinating is perhaps the most appropriate description for an emerald gemstone. Emeralds have the most intense, radiant and beautiful green that can be possibly imagined and some top quality emerald stones are even more valuable than diamonds. Going back in time, the historic Indian holy scriptures the Vedas, have writtend about the radiant green emeralds as bringing good luck and enhancing well being. 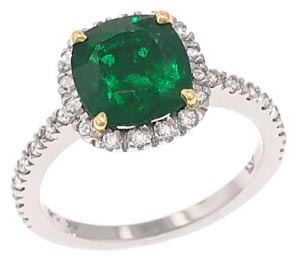 Emeralds have been held in high esteem since ancient times. For that reason, some of the most famous emeralds are to be seen in museums and collections. Some of the largest emeralds belonged to the Mogul Era in India during the 17th century. The New York Museum of Natural History, for example, has an exhibit in which a cup made of pure emerald which belonged to the Emperor Jehangir is shown next to the 'Patricia', one of the largest Colombian emerald crystals, which weighs 632 carats. Green heralds the arrival of spring, the joy of love and life, harmony and peace. In ancient Rome, green was the colour of Venus, the goddess of beauty and love. And today, this colour still occupies a special position in many cultures and religions. Emerald gemstone is regarded as the traditional birthstone for May, as well as the traditional zodiac birthstone for the signs of Taurus, Cancer and sometimes Gemini. 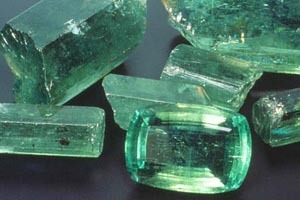 Emerald is a variety of the mineral beryl, colored green by some amounts of chromium and sometimes vanadium. A glance through the magnifying-glass or microscope into the interior of an emerald gemstone tells us something about the eventful genesis of this unique gem: here we see small or large fissures; here the sparkle of a mini-crystal or a small bubble; here shapes of all kinds. While the crystals were still growing, some of these manifestations had the chance to 'heal', and thus the jagged three-phase inclusions typical of Colombian emeralds were formed: cavities filled with fluid, which often also contain a small bubble of gas and some tiny crystals. The lively luminosity of its colour makes the emerald a unique gemstone. Emerald gemstones are a wonderful contradiction of nature, improbable in its existence as a gem. However, really good quality is fairly rare, with inclusions often marring the evenness of the colour. At the top of the list of countries where fine emeralds are found is Colombia. Emeralds come from three main emerald mining areas in Colombia: Muzo, Coscuez, and Chivor. Colombian emeralds differ from emeralds from other deposits in that they have an especially fine, shining emerald green unimpaired by any kind of bluish tint. The colour may vary slightly from find to find. This fascinatingly beautiful colour is so highly esteemed in the international emerald trade that even obvious inclusions are regarded as acceptable. But Colombia has yet more to offer: now and then the Colombian emerald mines throw up rarities such as Trapiche emeralds with their six rays emanating from the centre which resemble the spokes of a millwheel. The origin of an emerald though is not a guarantee of its quality. Good quality fine emeralds are also found in other countries such as India, Afganistan, Pakistan, Russia, Zambia, Brazil, Zimbabwe. Zambia, Zimbabwe and Brazil in particular have a good reputation for fine emeralds in the international trade. Excellent emerald crystals in a beautiful, deep emerald green and with good transparency come from Zambia. 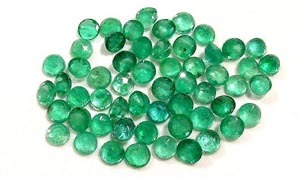 Their colour is mostly darker than that of Colombian emeralds and often has a fine, slightly bluish undertone. 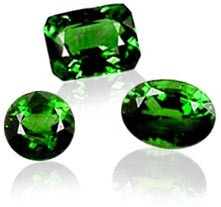 Emeralds which are mostly smaller, but very fine, in a vivacious, intense green come from Zimbabwe's famous Sandawana Mine, and they often have a delicate yellowish-green nuance. And the famous emerald mines of Colombia currently face competition from right next door: Brazil's gemstone mine Nova Era also produces emeralds in beautiful green tones, and if they are less attractive than those of their famous neighbour it is only by a small margin. Brazil also supplies rare emerald cat's eyes and extremely rare emeralds with a six-spoked star. Thanks to the finds in Africa and Brazil, there are more emeralds on the market now than there used to be - to the delight of emerald enthusiasts. Most emeralds are oiled as part of the post lapidary process, in order to improve their clarity. Cedar oil, having a similar refractive index, is often used in this generally accepted practice. Other liquids, including synthetic oils and polymers with refractive indexes close to that of emerald such as Opticon are also used. The use of oil is traditional and largely accepted by the gem trade, but it does have the consequence that these green treasures react very sensitively to inappropriate treatment. For example, they cannot be cleaned in an ultrasonic bath. The substances that may have been used by the cutter during his work, or applied subsequently, seal the fine pores in the surface of the gem. Removing them will end up giving the stone a matt appearance. For this reason, emerald rings should always be taken off before the wearer puts his or her hands in water containing cleansing agent. Check out your birthstone color .